You don’t have to be a PTI worker to see what Imran Khan’s peace march to Waziristan has achieved. Nor can you be so blind, unable to read and recognise the hypocrisy written all over Fazl-ur-Rehman’s and Abdul Ghafoor Haidri’s statements calling Imran Khan an agent of the ‘Jews’ and by personally attacking his ex-wife and children. And guess what! Fazl-ur-Rehman, self-proclaimed Pakistani pseudoliberals and US were all on one side, either due to being Anti-Peace-March or pro-drone or both. Not surprising actually! Any independent unbiased activist, anti-war and anti-drone humanist would wholeheartedly appreciate this big step that was taken by Imran Khan. I was appalled to hear and read some lame arguments from some ‘senior journalist’ who once shouted Why-Islamabad-and-Why-Not-Waziristan. Now the objection changed to Why-South-and-Why-not-North-Waziristan. Some of them asked why invite Americans to protest in Waziristan and rather not go to USA and protest in front of the White House (which CodePink activists did before coming to Pakistan). A few days before the march, the pseudo-liberal lot claimed TTP and Imran are friends and so they will provide him security which was later denied by the Taliban. Then, the march was stopped near Tank and was denied access to the area. It sounded amusing to some. The critics somehow overlooked that the mission was to highlight the issue with the help of the international activists which was symbolic as well as revealing. Do the noise makers suggest it should have been turned into a violent protest, to get to the area by hook or by crook? Hilarious indeed! The international media covered the issue for two consecutive days. This same media is used to brainwash people about the effectiveness of War on Terror and ‘accuracy’ of American drone strikes killing ‘militants’ alone. By raising the issue in an extra ordinary way this march has shown the people of these countries, the other side of the story. “During the day I shook the hand of a 16-year-old kid from Waziristan named Tariq Aziz. One of his cousins had died in a missile strike, and he wanted to know what he could do to bring the truth to the west. At the Reprieve charity, we have a transparency project: importing cameras to the region to try to export the truth back out. Tariq wanted to take part, but I thought him too young. According to a major study released by Stanford University and New York University named ‘Living Under Drones’ only 2 out of every hundred killed may be militants and the fear is immeasurable. 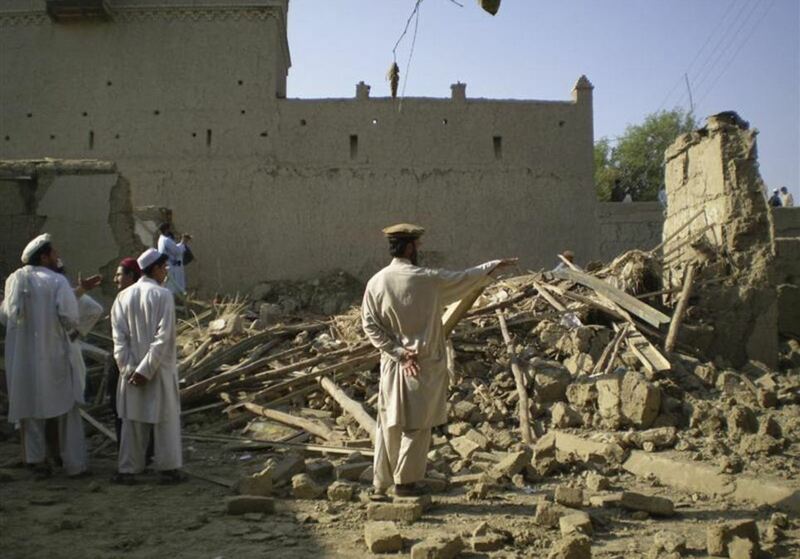 Drones are a familiar phenomenon for Pakistanis, Yemenis and Afghans but not so for the rest of the world. It was effectively highlighted; no sane person can deny the fact. And how many Pakistanis know where they operate from, how illegal they are according to international law and even US constitution and how they CANNOT operate without our government’s permission. ‘We condemn; you carry on’ policy of the Pakistani civil and military authorities is utterly disgusting. And now the whole world knows our leaders have made us a US colony where they are only puppets displayed to deceive us. Some leaders labelled the march as a ‘political stunt’ risking the lives of people and activists from the world to gain votes? Not so surprisingly, this does happen in Pakistan by the parties who have ruled us again and again so they painted their formula to label the march as a political drama. The silliest argument that really surprised me was ‘Would this march stop the drones?’ If that’s the point then beware: All marches are political stunts, all processions are pointless and all protests are useless as they don’t change anything most of the time. Let’s leave the intentions to God and not undermine the cause by such unjustified and childish squabble. The issue is national. There is a war imposed on us without declaration and one faction of intellectuals is bent upon legalising what the world holds illegitimate i.e. drones. The biggest ally is the major sufferer with innocent women and children being killed in double tap attacks (targeting the rescuers) or left amputated with post-traumatic stress disorder; Attacks that are carried out on the basis of ‘local intelligence’ gathered by awarding a few thousand dollars and using locals to tag the target with a GPS device, make someone’s fortune and ruin someone’s home and family. The march has brought attention to the forgotten people of Waziristan living under the killer buzzes in fear, avoiding meeting with each other with confidence and trust due to suspicion and terror created by the US. Support whatever is good and let not your personal, political and/or egoistic ‘self’ weaken the cause and make the world laugh at us. We have a problem, we raise voice, the good people from the world come out to help us but we doubt each other’s intentions. Woah! Don’t let the voice go weak. Strengthen it for the sake of the country and humanity. Play your part, positively. You’re answerable for your bit and every word that you contribute for or against the truth. Another excellent piece doc! & i totally concur with you saying, “You don’t have to be a PTI worker to see what Imran Khan’s peace march to Waziristan has achieved”. Those who have been trying to malign the intentions & tone down the response that this march has achieved globally have to to ask themselves few questions. what this march meant to tribal people, people that we met all along our journey, hear their horrible tales. how many loved ones they have lost, how they are surviving with their livelihoods impaired? you have to be a robot or stone-heart to listen to them & not to cry!! to me & many of us, it is very clear now that all those political parties who came down hard against this march, what their real motives are, & those parties, including religious parties who chose oppose openly or chose to stay silent (being silent means being party to crime) what their internal motives are. i am not surprised to see maulana diesel dishing out absurd comments. myself among many of my friends have always believed that choosing a political party is one’s right & choice. however after seeing the response to this peace march i would certainly ask one question to all. isn’t opposing anti drone peace march or even staying quite is supporting american imperial aggression & giving license to america to kill more innocent people? If it was unsuccessful, I want more of these unsuccessful rallies to bring people closer, I want people from around the globe to meet each other and realize that everyone living in there is not a terrorist, that’s an achievement in itself. 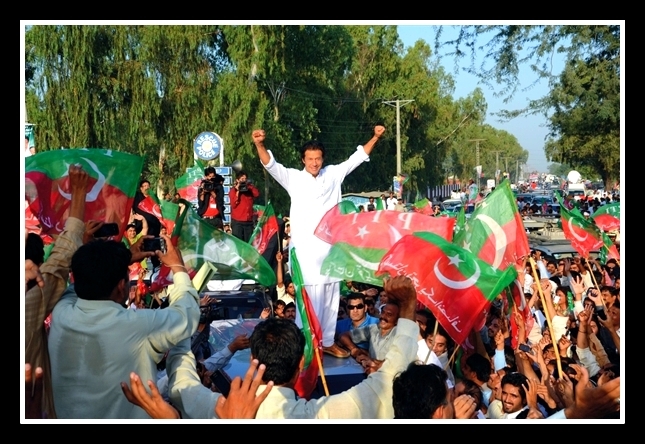 thanks for writing, this blog is quite a relief after reading absolute rubbish on express tribune…. Thanks Aisha for voicing our thoughts. Wonderfully written. Please shake up our news media and ask them – do they have any right to be called Pakistanis at all? These drones are actually attacks by a foreign nation on to our soil and our people. Have they forgotten how the whole country stood rock solid against foreign aggression in 1965 ? The difference that this Peace March has made is clear from various articles against drones – people around the world just didn’t know the facts, which can be seen from various comments on these news stories. Great work PTI ! That peace march was totally a drama. If Imran khan is too concerned about drone attacks then why khursheed Kasoori and Shah Mehmood Qureshi are in his party? Simply brilliant & quite pertinent. Magnificent article. Mam hats off to u. It is really an eye opener and incredible piece of work that u have conveyed to the world. Appreciate your effort and one thing i would like to mention that u must also highlight those fake liberals in detail who oppose even the cause or who were/are trying to create a negative image of the said rally. Moreover now critics r just praising a hypocrite Maulana Faz ur Rehman who is actually on a permanent payroll of anti Pakistan and anti islam masses. In the same way now many media personalities are now directly criticizing Imran’s personality n even abuse him indirectly on social websites. Must this rally exposed many fake liberals which must be an eye openers for those viewers/listners who have been following them since long. I have one suggestion that plz do write on todays incident of Malala Yousufzai murder attempt to which many many fake liberals n hypocrites starts criticizing Imran Khan and PTI Peace rally. They r trying to create hype and co-relating the two incidents in a way that IK is responsible for that attempt. Even political parties r using it along with some paid journalists for point scoring. There must b a bottle neck for these kind of ppl. Great post Doc. good job. i must say you are right at pointing out the attitude of “enlightened” ones because only there acts are worthwhile and only they are legitimate to do anything for Pakistan and society as per their self build ideology. anyone who differs from their thought have no right to do anything good and if they try to do some good there are questions asked like, “why its been done this way, and why that way was ignored”. just a request to all those who are pointing this march as political gimmick please go out there in Waziristan an d conduct a real one if you have a “kidney” to do so. Great article. Why the champion of human rights ‘Asma Jehangir’ go to sympathize with the drone victims and people of waziristan region. Where do these human right organizations in pakistan derive their funding from. Whey are they keeping a mum over this inhuman drone strikes. All they did was to criticize the activity and play to the wishes of their masters. People like saroop ijaz, najam sethi and asma jehangir are a national liability. It is Imran who deserves a Nobel Peace prize, not Obama for working selflessly for human rights and human social welfare. America and Taliban both are terrorist and may God vanish both.